« Sai Baba’s death super scandal: his cousin’s campaign for justice! Millions from across the world to visit new Sai temple? 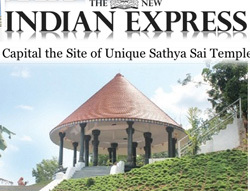 The New Indian Express reports that the Sri Sathya Sai Orphanage Trust at Thiruvanathapuram has created a unique temple for Sathya Sai Baba in that it will be the first place where an idol of Sathya Sai Baba will be worshipped. This is supposedly the first ‘idol’ for worship of Sai Baba, and bhajans will be held at it. The founders of the this new temple are confident that it will become “a pilgrimage centre to millions of people all over the world”. (Or, with dollar signs in their eyes, they really hope for this). Their confidence – though not their desires – are in contrast to Prashanthi Nilayam and the Central Trust usurpers of Sai Baba’s fortune and heirlooms who now preside over a near-deserted ashram (apart from conscripted students and local villagers coming for handouts). However, it appears that the hopeful temple builders couldn’t even afford to put up walls (to control the flow of millions etc. ), though that is convenient because no need to do maintenance or guard it. How long before sexually or other abused victims of Sai Baba or those who knew Sai Baba’s true self-seeking lying nature tamper with the idol? One may expect the impoverishing and envious Prashanthi Nilayam gang to castigate and disown the Orphanage Trust. This entry was posted on April 27, 2015 at 3:18 pm	and is filed under Sathya Sai Baba. You can follow any responses to this entry through the RSS 2.0 feed. You can leave a response, or trackback from your own site.